Honeypot in the Orange Roof Cottage pattern. 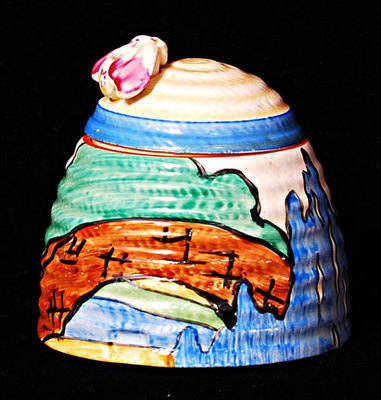 Size is 3.75inches tall (the larger of the two Honeypot sizes). No damage or restoration. Nicely painted with lots of pattern, but doesn’t have a cottage. Signed Bizarre by Clarice Cliff. Price £465.